Some triathlete friends describe training for Triathlons as a swim-bike-eat-sleep-run-bike-eat sleep-repeat process. I didn’t quite understood their description until this week. Preparing for the IronMan70.3 event in August was making me feel anxy. Blog, you know what happens when I get anxious right? I get stressed, worried and I lose my cool. So not good for the skin. I wouldn’t want wrinkles to start to show. Anyway, I knew that I needed to get help someone. Particularly a tri and a swim coach as well, swimming being my weakness. I did mention that I wanted Ige Lopez as my tri coach so after a short meeting, he agreed to develop my program. He emailed me the program late Tuesday. Saw it after I got home from my 1.4k swim. It was intense but again, I gotta do what I came here to do so I vowed to follow the program to the tee. Truth be told, my last training run was December 28. It was a short but sweet 6.5K run around Alabang. We had a short staycation at Crimson Hotel in Alabang after my 8yo’s visit to the pedia. I know what you’re thinking – Uhoh, you are so not ready for the 12k run. You said it. I was determined to finish the distance prescribed by Coach Ige and so I did. It wasn’t one of my best performance but I still finished it. The route I took was the same route we always take. BHS, Mckinley Drive, Lawton until Bayani road (I added this part), down Mckinley Hill and back, left near Blue Leaf, towards Emperador stadium and back, up again towards Lawton, right towards Mckinley drive. If this was our normal 8k route, we would’ve made a right going back to BHS across Audi. But our target was 12k so we made a left towards Pacific Plaza, passed Mind Museum, St. Lukes, right behind St. Luke’s S&R, right towards BHS. We wouldn’t gone straight towards our starting point but we’re still missing 1.3k so we made a right towards Track 30, followed the “big loop” of BHS. Ended by the parking where we started at exactly 12.1k. Cool huh? I knew exactly what route to take. Smart? Nah! Just prepared. I used mapmyrun to well map my run. My right trapezius was killing me. My right hip was in pain but I was happy. I so missed running beyond my usual 8k. Haha! I still had enough energy to go shopping. Wanted to buy a Garmin cadence sensor as Noy accidentally broke mine by not installing it properly. What a waste. It’s a good thing though that I decided to just buy it over the web. Got it only for $33, down from $68. Thank you Amazon! I was in pain when I went to bed that I was laughing at myself coz I felt like an old lady. When I woke up the next day, the pain was gone but I felt sluggish. I had to fight the urge to go back to bed. I dragged myself to the room to change, to the playroom/gym to ride my bike. I kept on asking myself – why are you doing this Gail? Sigh… But when I started pedalling, I found myself again in my happy place. Endorphins, I love you! One hour passed by quickly. I wasn’t even able to finish the episode of The Mentalist that I was watching. Had to run to meetings and was looking forward to tonight’s swim. Telling myself….I really need a swim coach. Ask and you shall receive. I got a call from Nonoy Basa who I sent text message to the previous day. He said that he was opening up a class in Chateau Verde Valle Verde 1 which was way easier to get to than Makati sports. However, sessions would be Wednesdays and Fridays. Ohhhh…gotta inform Coach Ige so he can adjust my program. This means that my 2k swim will not be happening that evening. Awwww…. Hubby also didn’t want to swim so double awwwwww…. Thank God for teammates! I quickly messaged my female Greenhills Tri teammates asking if anyone of them would like to swim with me. Fortunately, Lianne Yao gave me a huge YES! She’s swimming at Celebrity Sports Club and has invited me to join her. Yay! 2k swim here I come! I did my first 2k straight swim in Celebrity’s ice cold water. Seriously, ice cold. Brrrrr…. Lianne, was faster and definitely more graceful than me. By the end of my swim, my left arm was so painful that I could barely move it without feeling an pain. This is a big problem, I told myself. The odd thing was, I notice that after each swim training, I find myself starving. But when I run, I do not feel hungry. Maybe I’m dehydrated when I swim. Got to figure this out or else, the more I swim, the more I eat. Noooooo…. I felt refreshed the next day. I felt uneasy that I wasn’t doing any exercise in the morning. I told myself – Oh it’s my restday. Uhoh…apparently, my schedules got mixed up as Coach Ige had to adjust it to accommodate my training sessions with Noynoy. Silly me. I couldn’t wait for the day to end so I can start my swim lessons. Friday traffic made my drive to Valle Verde 1 a really daunting task. It took me an hour to get there. Thankfully, Coach Nonoy was busy swimming when I arrived. It was a cool, windy evening and since his condo’s 25m pool was elevate, it made it even worse. This will be one cold cold swim session. First on the agenda: video analytics. Nonoy had me swim 200m while he takes my video to analyze my strokes. He explained to me areas of improvement but generally said that I will probably survive the swim event of a triathlon. Yahoo! ….But probably won’t meet cut-off….Awwwww…. Second: Drills. Since Nonoy Basa is a Total Immersion instructor, he explained to me drills which I was a bit familiar with. However, he added some strategies which he feels are important when competing. Last: Cool down. He wanted to extend the session but I was already freezing. Plus some of hubby’s friends were in our house for a post holiday get together. Yeah right, truth be told, I was just really freezing. However, since hubby lacked sleep from partying the night before, I decided to break this trend and train alone. I had to stick to my program. I knew that some of my GHTT teammates were training in Aguinaldo so I decided to run there. I parked in Logcom and started my training. After 4k, I saw Melly and her boyfie, Franz. She said that some of our teammates were by the pool. Since I didn’t know where the pool was, I decided to continue on. Finally! The familiar site of our team uniform. I immediately headed back and joined them. I ran with Jaan and Josette who I must say were quite fast. They showed me a route at the back of the main road which had killer hills. Uhoh…next time, do not run with podium finishers…I told myself. Haha! After 6k more or less, I finished my 10k and had to get home so I can have breakfast with my family. Finished the 10k at 1 hour 14minutes. As Coach Ige said, still slow. Remember your goal is to get closer to 10k. Haha! 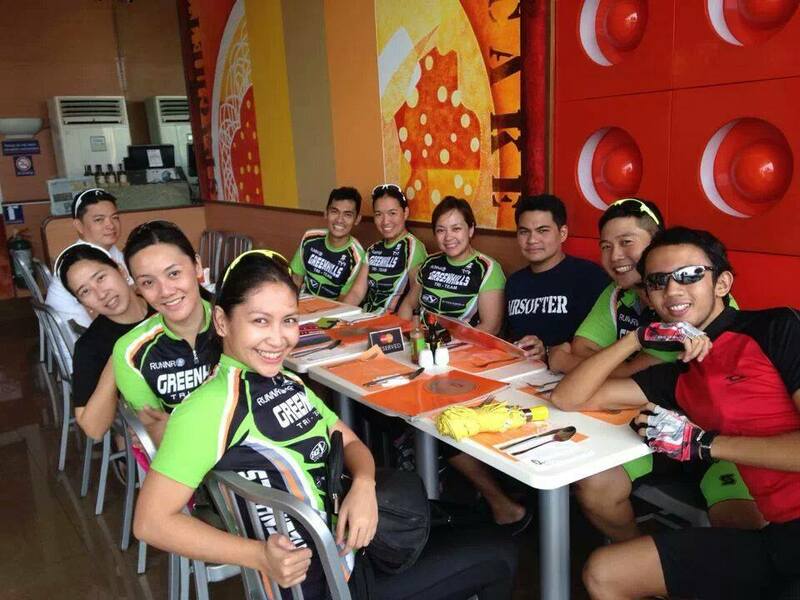 Hubby & I met up with my GHTT treammates Lianne (she rode with me), Melody, Melly, Malou, Berns, Franz and others at 7-11. Some went ahead while others stayed and waited for the others. I knew something was up the first few kilometers. 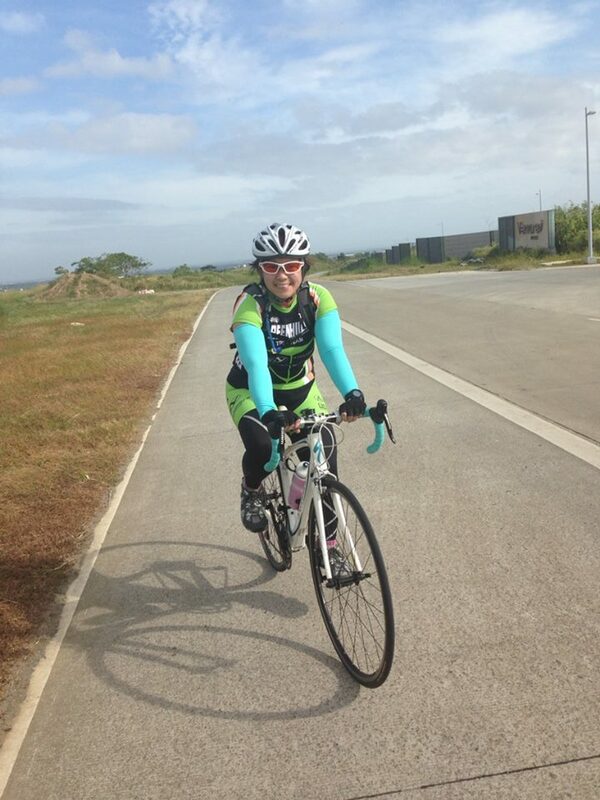 I was riding with Lods (Melody), a veteran Triathlete until I decided to stop to wait for Noy. My quads/legs felt weak. To think that this was just the first uphill. BIG problem…. I had trouble going up the ascends, felt weak and surprisingly cold. Oh no….thankfully I had a pack of GU which I consumed during the 2nd loop. I knew that I wasn’t able to finished 60k. Taken during the second loop. The photo above was taken during the second loop before stopping to consume my GU. Fake smile. Was really struggling here. Imagine, Noy was in front of me? How can that be right? Haha! During the last 15k, I had the privilege to ride alongside of Berns, who obviously was taking it easy. We chatted and she kept me busy to realize that we were almost back at the parking area. Yes! 50k bike ride done! I was so ready for breakfast. I was 10k below my target distance but 50k is not too shabby. Plus it was faster than our last ride. My favorite part of team training…the food after 🙂 Yum! Or so I thought. I lifted light weights and a session of P90x Ab RipperX just to keep my endorphins up. And so it begins…another week of training. This will be my life for 6 months. I sure hope this suffering will mean that I will survive and finish (within cut-off), the IM70.3 this August.